Thus says Mrs. Jennings (Rachel Stadeli), the busybody and wishful matchmaker, who would have loved to be the architect of every romantic attachment in “Sense and Sensibility” (adapted for the stage by Emma Whipday). But although she’s the one letting out secrets, maneuvering characters from one location to another, and reveling in gossip, Mrs. Jennings has far less power than she believes over the lives of others. Ultimately, the burden falls on the lovers themselves to navigate the twists and turns of romance. In the beginning, each character approaches love in their own way. Marianne Dashwood (Noelani Eley) believes love should be passionate and exciting, and that true love will only come once in a lifetime. “If you have truly loved once, how can it be possible to love again?” she declares. Dressed in white, she exudes a cheerful naiveté, believing that love will come easily, in a fiery flash. Her greatest fear is boredom. Her sister Elinor (Heather Bellinger), by contrast, waits patiently for love. Rather than expecting fiery passion, she is content with a kind glance, quiet conversation, and an underwhelming declaration of “friendship” by the reserved Edward Ferrars (Joseph Elkins). Levelheaded, cheerful, and serene, Elinor finds contentment in a life that Marianne declares boring and dull. Her greatest fear is allowing her true feelings to be seen by others. Yet both sisters adore one another and manage to find happiness in the small cottage they inhabit with their mother, Mrs. Dashwood (Natasha Wilson). Although the death of Mr. Dashwood has left them financially strained, as his inheritance fell to their greedy cousins John and Fanny (Luke Douglas and Nicole Peeke), they’ve managed to create a cozy existence. But their quiet, domestic world is turned upside down when Marianne ventures out for a walk in the country, gets caught in the rain, and slips and twists her ankle. A mysterious man comes to the rescue, scoops her up, and carries her home. His name, she discovers, is Willoughby (Brendan Fugere), and she’s swept away by just the kind of adventurous romance she’d always dreamed of. At the same time, Elinor discovers a secret about her suitor Edward’s past, which begins to challenge her assumptions about love. Will everything work out in the end if she can simply be patient? Or will she lose him if she doesn’t take action? While the Dashwood sisters are the central characters, the audience will be equally entertained by characters such as Mrs. Jennings, whose exuberant attempts at meddling in the Dashwood sisters’ lives provides lighthearted comedy. Sir John Middleton (John Crocker) seems determined to enjoy the delights of English society while remaining oblivious to any underlying tensions, while his friend Colonel Brandon (Ethan Miller) quietly becomes captivated by the beautiful Marianne but finds himself unable to break through her prejudices and convince her to see him as anything but an old bore. As if secrets and unrequited love weren’t enough, “Sense and Sensibility” also includes brief interludes of singing, English country dancing, sword fighting, and the occasional harpsichord performance. 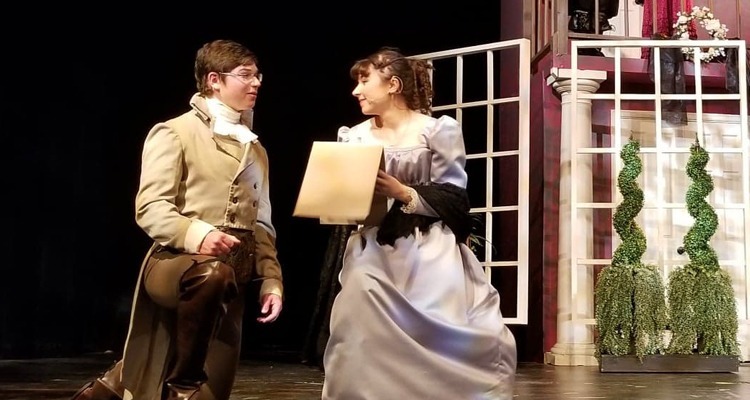 Corban Theatre’s production of “Sense and Sensibility” promises to challenge the audience’s assumptions about love, propriety, and loyalty. Audience members will be transported to Regency England not only through spectacular hand-sewn costuming, complete with empire waistlines and puffed sleeves, but also through the actors’ portrayal of affections: how a simple look, a missed step in a dance, or the touch of a hand can signify passions and desires that aren’t allowed to make their way to the surface. Check out the schedule of remaining performances and purchase your tickets today!